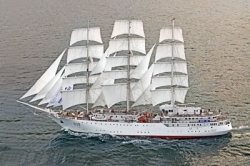 Rolls-Royce has announced that it will install a hybrid power system on board 104-year-old Norwegian sail-training ship Statsraad Lehmkuhl, while Norwegian state-owned company Enova will provide more than US$520,000 in financial support to equip the historic square rigger with shipboard battery power. The ship is also being made ready to receive onshore power to recharge the batteries, ensuring zero emissions in the ports the ship visits, including at its home port of Bergen, Norway. The vessel is currently in dry dock in Bergen, where a special battery room is being built. Due to the ship’s sailing schedule, the project will not be completed until November 2018 at the earliest. The vessel currently uses diesel generators to power shipboard systems, and for propulsion if necessary. Once installed, the battery system will assist in both areas, thereby reducing the number of generators that need to be kept running. The battery system will also allow the power of the wind in the ship’s sails to be exploited.